I feel like I am recovering or rather bouncing back from a mini-vacation. It has been a long break from work after a while and I decided to ditch the idea of keeping up with blogging the thanksgiving table real time, in fact, I almost stayed away from social media altogether. Life can wait, the recipes that deserve their time on the blog will eventually shine through, and yes today I am back with Baba Ganoush, one of my hits this holiday. In fact, the idea of the meze bar which included my pineapple chutney, hummus and the Baba Ganoush was an amazing hit. 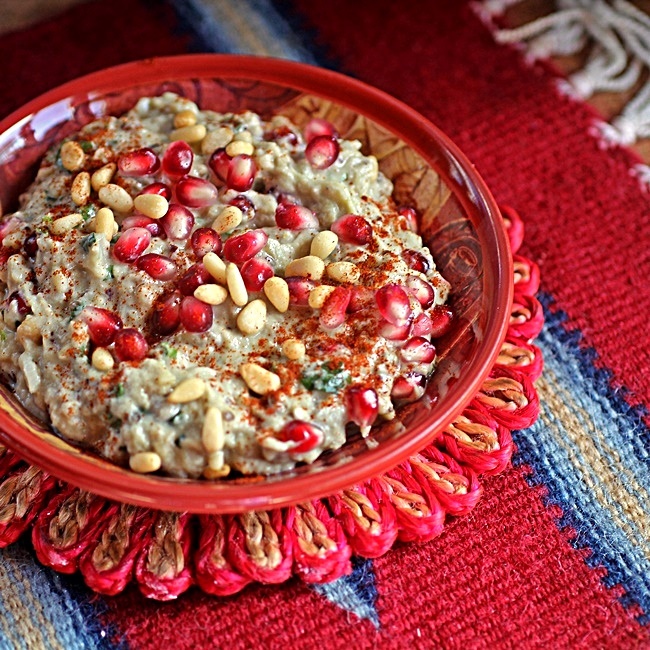 A Baba Ganoush or Baba Ganouj is a smoked eggplant dip of Middle Eastern descent, it has many variations and is typically a meshing of smoked eggplant, garlic, tahini and possibly parsley. Other garnishes, such as my addition of pomegranate seeds are optional and can be used at the chef’s discretion. With an attempt to ensure some visual appeal, as well as keeping with the harvest theme. The one simple change that I made to the recipe, was also to include lightly toasted garlic in lieu of crushed fresh garlic. My son tends to find the raw crushed garlic too strong, so I increased the quantity hoping to be able to balance the taste. 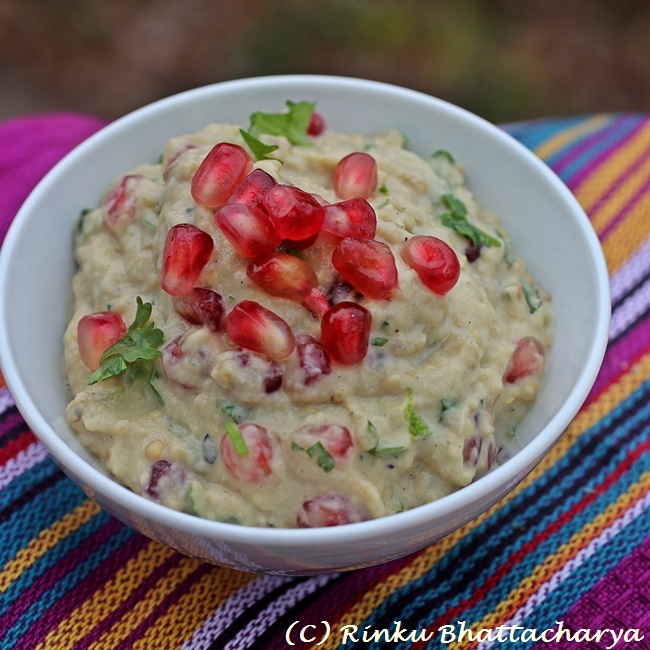 I will also confess, my recipe comes to me from conversations with various people while tasting their more authentic offerings, although the Baba Ganoush is indeed in some ways similar to the Bengali smoked eggplant puree that we call Begun Pora, except we use mustard oil and onions and of course a sharp smattering of green chilies. Considering, I was asked to make this yesterday again and looks like we polished off as many as seven medium sized eggplants, this variation is certain going to be one for the family series. A smokey eggplant dip, Baba Ganosh is a classic meze of Middle-Eastern origins. 2 tablespoons of tahini or sesame paste. To prepare the eggplant, roast the eggplant over an open flame to completely char the outer skin. This is best done over a gas stove or an open grill. Use a pair of tongs to turn the eggplant so that is is cooked uniformly. Set aside to cool. In the meantime heat the oil and add the garlic and cook until it the garlic is golden brown and fragrant. Set aside. Carefully peel the eggplant, I find it easiest to peel some of the skin, making an opening and then scooping out the flesh. Place the scooped eggplant in a mixing bowl and mash the pulp. Add in the salt, pepper, tahini and mix in the garlic oil and stir well. Add in the parsley or cilantro, pomegranate seeds and the lemon juice if using. Serve with pita chips or crackers.